Based on a unique combination of skills in mathematics, computer science and practical experience, both in industrial processes as well as in engineering sciences, the interdisciplinary teams of the RISC Software GmbH develop (individual) software solutions for business and industry. The special feature of RISC Software GmbH is the combination of scientific knowledge in mathematics and computer science, as well as the ability acquired over the years to translate complex and challenging industrial problems into useful and sustainable software. Whether individually adapted to existing systems or implemented consistently, the customer gets solutions that he/she actually needs for his/her operations in the company. The result is individual software solutions beyond standard software, which give the customer a competitive advantage over its competitors. Consequently, RISC Software GmbH is divided into three application-oriented business units and one knowledge-specific competence area. These units cover different disciplines and create a wide variety of solutions for engineering, logistics, information technology and medicine.. 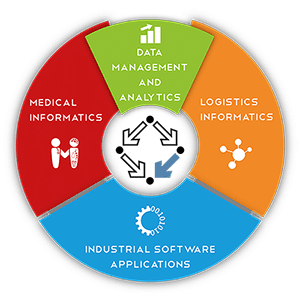 The Unit Logistics Informatics (RISC-LI) designs and develops software for the planning, optimization, simulation and control of processes, e.g., the mathematical optimization of production processes, the planning and simulation of supply networks, intra-logistics or internal material flows. It provides the combined expertise in the areas of smart transport logistics, information systems for logistics networks, as well as material flow and production planning. Industry knowledge is as thereby important as technical know-how and application-oriented research in this area. The Unit Industrial Software Applications (RISC-ISA) specializes in industrial applications for simulation, analysis and optimization in engineering disciplines. It is highly specialized in the needs and requirements of modern industry and creates custom software to meet the stringent and complex challenges of industries such as aerospace or machine tool manufacturing. The Unit Medical Informatics (RISC-MI) conducts applied research in modern medicine. Here, highly specialized and internationally used software is developed in the areas of medical image processing, biomechanical simulation and patient virtualization. The competence area Data Management and Analytics (RISC-DMA) is all about sustainable data management. Using analysis algorithms, visual analytics, forecasting tools and approaches from machine learning and bag data management, customers and research partners from a wide variety of disciplines gain extensive knowledge from their own data. DMA sees itself as a crosscutting issue within RISC Software GmbH and thus applies in all three business areas. At first glance, these completely different areas combine the symbiotic combination of mathematics and software engineering with industry expertise to create software solutions for the economy. This is not about a separation, but rather a bundling of different strengths in specialized disciplines. A mutual exchange is an important principle and part of the corporate culture. Accordingly, many projects are handled on an inter-unit level.